The Stealth Yellow Spinner is one of the very successful Stealth series of flies. This is an excellent pattern that imitates the final stages of the life cycle of the naturals. It can be fished with confidence from April until October and is at its best when trout are feeding on spinners in the evenings. The hook is reversed to allow the fly to sit temptingly on the surface film. Tail : 2 strands of grey DNA Frosty Fibres. Body : Pale yellow superfine or similar dubbing. Wing : Poplar/ash wood DNA Frosty Fibres mixed and tied spent. 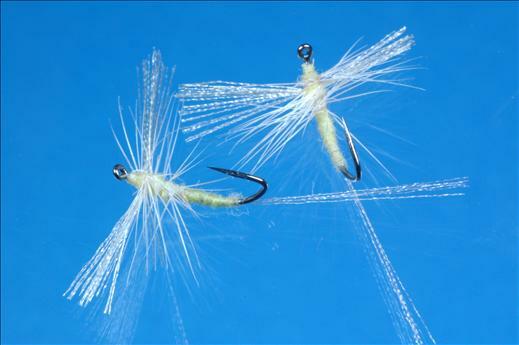 The Stealth Spinners are tied as spent flies with wings set horizontally. The hackle is clipped tight underneath the finished fly so that it sits correctly on the surface. DNA Frosty Fibres splits into three during use so should not be tied too heavily. Tails should be tied longer that the body. Currently there are no comments about the Stealth Yellow Spinner fly pattern from other fly fishermen yet.